The sun rose behind our tent, illuminating the land mine signs that bordered the narrow road we’d camped on. Ahead was Uzbekistan. Behind, Turkmenistan. We were in the gap between. In no-mans land. 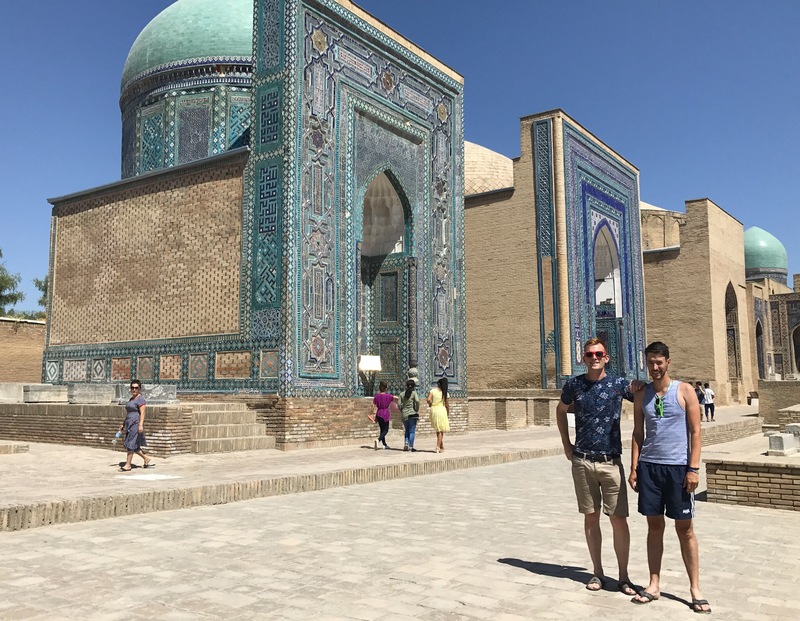 Our Uzbekistan visa started on August 8th, but we were there and ready the day before. 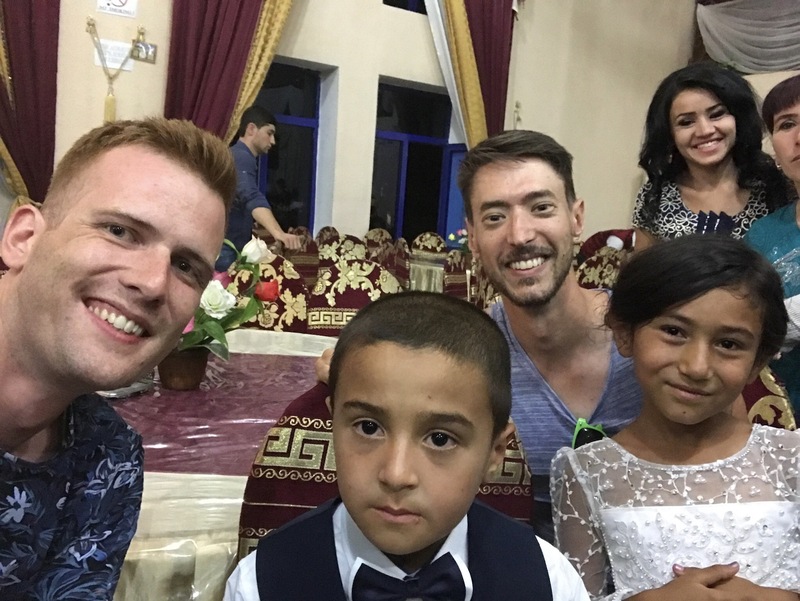 We exited Turkmenistan and drove the 20 metres to the Uzbek border. There was a slim chance they’d let us in early…but they didn’t. The border town of Nukus on the Uzbek side looked sizeable as we crossed the gates the next day, but proved too small to provide us with a dollar top-up. It meant that for the next 600km we’d have just six dollars between us. We swapped it for three large bottles of water and set off, uncomfortable with our vulnerability in the desert and our lack of resources. It was 43 degrees as we trundled almost the length of Uzbekistan, sipping tentatively on our limited supplies. We switched driving every 50 miles with mini power naps passing the time between changeovers. Samarkand was our destination, but a night in Bukhara was essential as sunset approached. Throughout the stan’s dollars are widely accepted, especially in hotels and guesthouses where often local currencies won’t be taken. Having exhausted the bulk of our dollars on our Iranian carnet it was vital that Bukhara came up trumps with some cash. Fortunately it did, and a wander to the city’s single international ATM also took us past Poi Kalon Square and the Kalyan Minaret. 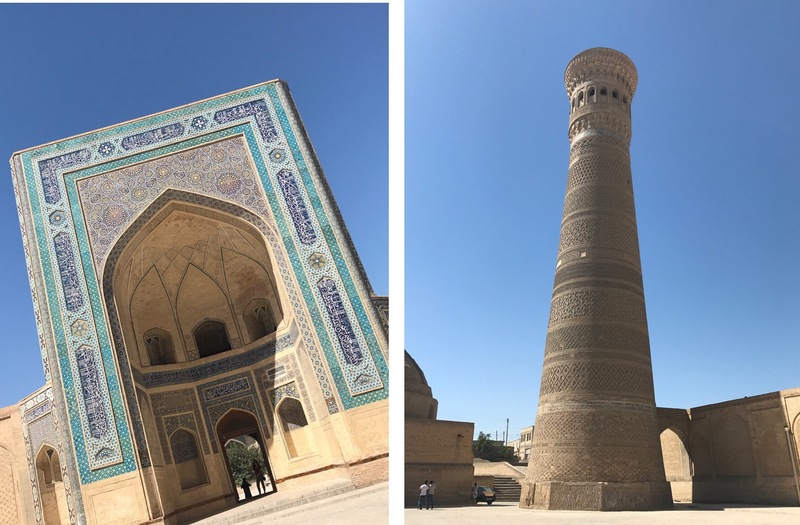 A kerfuffle of winding streets, tin roofed shacks and shoddily bodged concrete buildings surrounded the pristine central Registan Temple of Samarkand. A small metal door hidden among the many rusting entrances swung through into a huge open courtyard. Vines hung down from the balconies above, that unevenly lead the way to the twelve uniquely sloping rooms of the Furkat Hostel. Melon greeted us along with chai, and after 30 minutes of pure rest, so did Alex, our long lost camera women! A free day gave chance to explore this city abuzz with development. Mixed feelings followed, as thousand year old temples stood proud with their newly restored facades and even surfaces. To see these godly structures in their true colours revealed a city perhaps as it was a thousand years ago, though, to restore and revamp something with such diverse history, is perhaps an injustice to the very history it remembers? Nevertheless, the bazar that swept around three sides gave a splash of authenticity and a taste of the the city’s trading roots. We set off as the sun dropped avoiding the heat of the day. Our benzene supplies were running low, having crossed the Uzbek border laden with 100 litres of 20p fuel. Buying petrol here was illegal, and black market supplies, served up in juice and water bottles, were hard to come across and notoriously dodgy. With the northern Uzbek / Tajikistan border shut there was no option but to drive south and around to the eastern passage. As night approached we began searching for somewhere to wild camp, or a cheap hostel to crash in. We pulled up to the only hotel for miles in a small town a third of the way to the border. Bright lights shone out of the large entrance, and a mist of low beats oozed from the grand marble front. As we enquired as to any vacancies (there were none) we were scurried through into the party room, given some well fermented peach juice, and a large fresh loaf to munch on. The music picked up and no quicker than I’d suggested a slight shoulder roll, were we all up on the dance floor with aunts, uncles, grandmas, and one very confused 11 year old, celebrating his eleventh birthday! 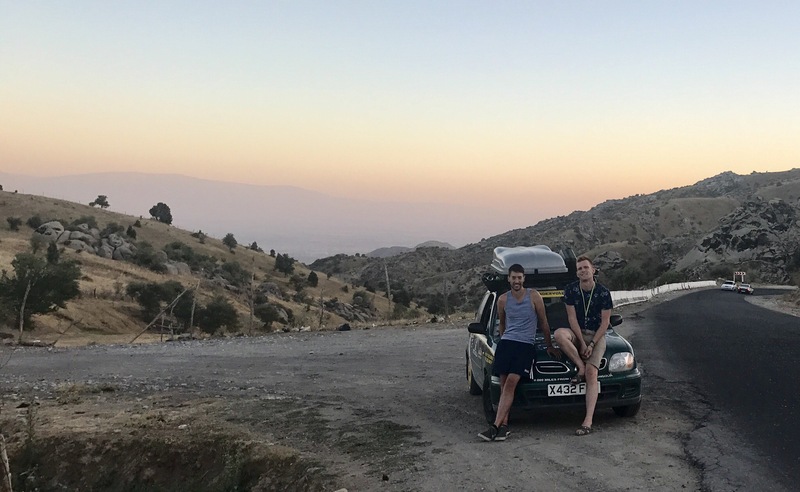 Dushanbe was a breath of fresh air – post arduous border crossing requiring the entirety of our car to be emptied. Wide streets diverted orderly queues, traffic lights functioned and supermarkets sold vegetables – something we’d greatly missed. Chris and Rico, a duo we’d met earlier at the gates of hell, were couch surfing ahead of taking on the Pamir Highway. 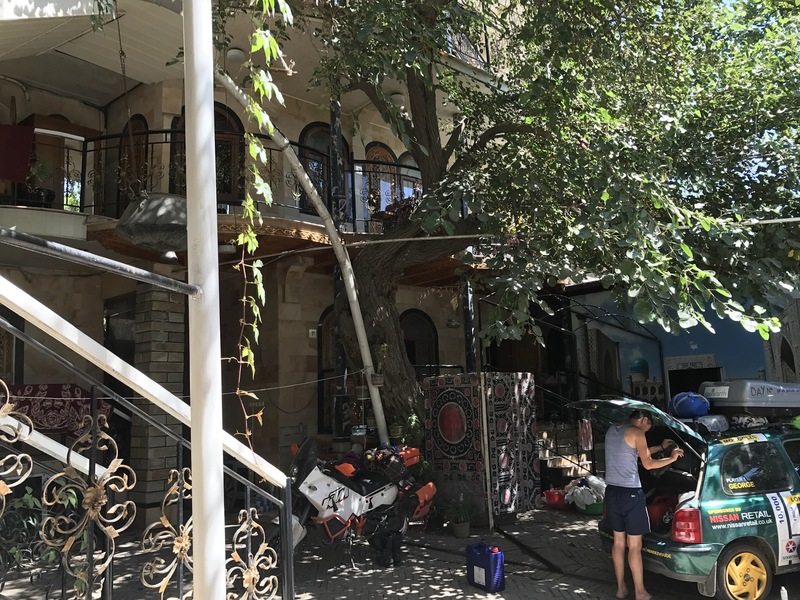 We had a little more luxury at the Green House Hostel, but our plan was the same. 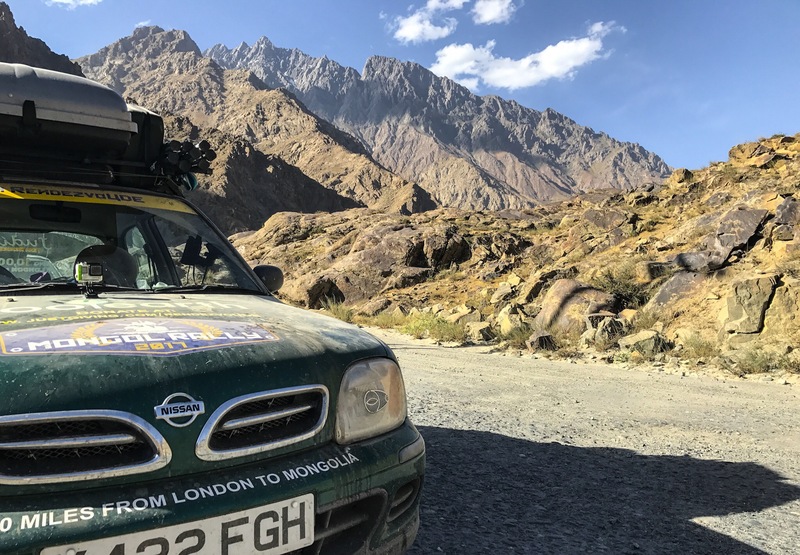 The Pamirs, a five day trek across unfriendly roads and huge mountain passes were the next leg of the adventure, and we’d drive it in convoy – sharing the cooking and providing a ‘car swap escape’ for when each other’s company became too much. The northern route of the Pamirs see’s some of the toughest driving of the entire range. The route leaves Dushanbe from the east on tarmac for 50km. A right turn took us off the main road, onto dirt tracks. From that turn we travelled for four hours, covering just 22 miles. We weaved up and around huge passes, gorges and valleys. Peak District sized rocks pierced the ground, revealing fifteen or twenty different vibrancies and tones of rock, and a millennia of history. 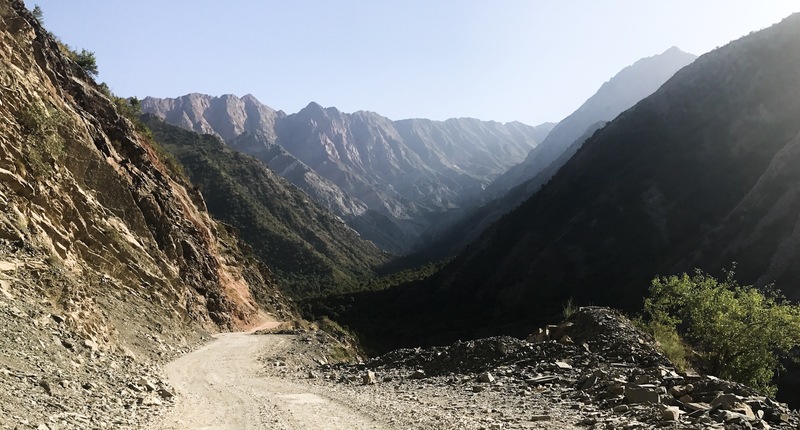 The road rambled unsurfaced for miles, skimming the edges of a slowly increasing drop to the valley floor and the hundred metre wide river that etched the sides below. After three hours there was a noticeable change. Quick pee-dashes to the side of the tarmac became more effort and scuttling back down the road to snap the view behind left me breathless. Ahead of us was snow, peppering the peaks that lead the way to Khorog, our halfway point to Kyrgyzstan. In the space of an hour we’d driven to 11,000 feet. The track ahead only climbed higher. To our right clouds scarfed the peaks in the distance, and on our left, a huge wall of rock stood grand unphased by the road that lightly scared its surface. Outside of an aircraft this was the highest I’d ever been – but over the coming days we’d continue to climb even higher. That evening we pitched up our tents on a grassy spot just besides the river. It was our turn to cook -spaghetti bolognese. Within minutes we were sniffed out by the local cows, who joined us for dinner. We sat back in our camping chairs, head tilted back, watching the light disappear and the milky way take its place. This was a moment to be bottled. Chris and Rico washed up, part of the deal of us cooking, and we head to our tents. 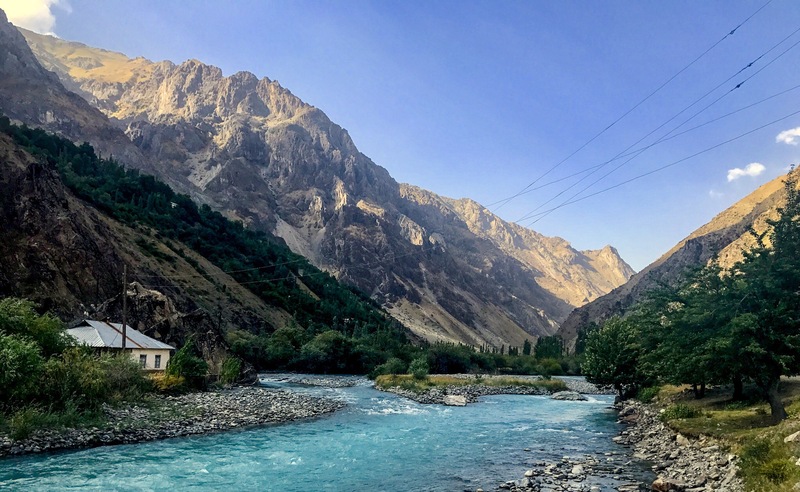 We were two nights along our Pamir adventure. What we’d seen so far had pipped almost every landscape we’d ever seen, and it would only get better.